A visit from George Balazs is always a summer highlight and it doesn't matter what other joys any summer might generously provide. It's simply wonderful when he spends a day here. This week George showed up with the express purpose of seeing his special honu 5690. Last summer we spent many a night together on a Lahaina beach watching this turtle mother lay her eggs. 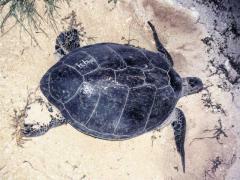 We also helped George outfit 5690 with a satellite transmitter so that he could learn more about this amazing turtle. 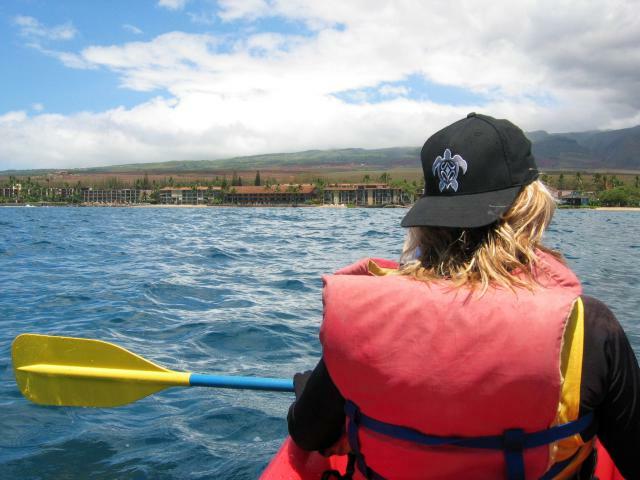 As it turned out, for most of the year she spent her time in and around Napili Bay. Many an afternoon she could be seen foraging in shallow water right off the Gazebo Restaurant. Then for reasons of her own, 5690 re-located. Ironically, the batteries on her transmitter failed at about the same time. For a while, George didn't know where she was, so one of our priorities when we arrived on Maui was to see whether we could find her again. A diver had reported seeing her at Hawea Point sometime in June. When a kayak tour operator also said that he saw a turtle with a transmitter regularly off that point, we decided to look for her there. We decided to look for her off Hawea Point. 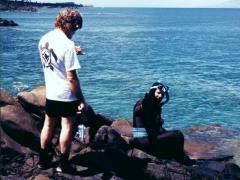 She was there, all right--most mornings, anyway-- right smack in what looked like a most diver-unfriendly place! Through the binoculars we could see her surface for air, uncaring about the way she was being tossed around by waves, and that was just the mornings. By afternoon, the trade winds whip the waters off Hawea Point into a witch's brew. When George arrived on Sunday, we walked with him up to the point in mid-morning. 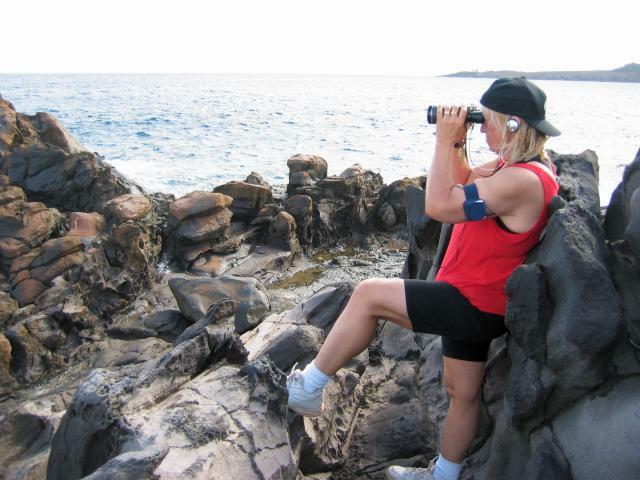 Using binoculars, we spotted 5690 quickly and easily as she came up for air. Excited, George insisted he wanted to snorkel out to see her. This was something we had hoped he wouldn't want to try. We really believed that once George saw how far out she was and the frothing, churning foam, he'd prefer seeing the turtle from the safety of our high rocky lookout. Excited, George insisted he wanted to snorkel out to see her. Of course, Peter wouldn't let George go into the water by himself and so Ursula got to watch two males do what only males would think of doing. She kept her cell phone handy ready to call 911. George and Peter snorkeled for almost an hour and a half and never once saw 5690. Ursula, on the other hand, comfortable and dry on her rocky perch, managed to see her three more times as she surfaced for air. 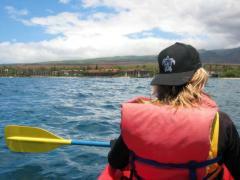 After Peter's success at kayak tours with Kapalua Dive Company, we decided to rent a kayak and conduct some above-water surveys. We toured the waters around our dive site and managed for the very first time to see our turtles in a new and different way: from a boat and from above! We decided to rent a kayak and conduct some above-water surveys. We were in for a bit of a surprise. 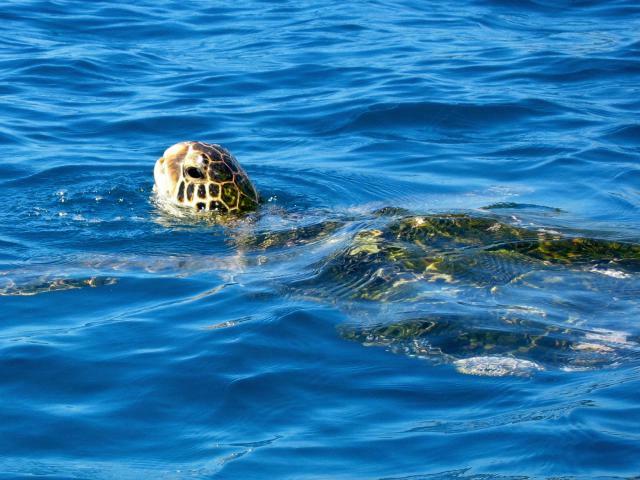 The same laid-back honu who let us settle right beside them underwater were skittish when approached in a kayak! Most turtles dived the moment they saw the red boat close in on them. This was a nuisance, of course, but considering that three catamarans truck their way over these turtles every day, we're rather relieved our honu have such a strong aversion for boats. We did manage to photograph some turtles sipping air--and it only took close to three hours of rigorous paddling and baking in the afternoon sun. We did manage to photograph some turtles sipping air. We finally headed back to the beach. Landing the kayak wouldn't be easy. Swells were happening and over the last couple of days, waves had licked the sand away, exposing nasty rocks. Our once safe and sandy beach now required considerable acrobatics to leap out the kayak and pull the boat high up and out of the waves. We managed this, but not with the grace of The Skilled. The swell and the rocks helped us decide to return the boat the next morning. We'll wait for kinder conditions. Speaking of diving, we returned to our alternate turtle site this week to document this new ohana of honu. George Balazs kindly loaned us a temperature logger that we also planned to set out. George Balazs kindly loaned us a temperature logger that we also planned to set out. We selected a nice calm morning to show up, but once we arrived on site, we were truly disappointed by the misty, milky water. With the skeletal white coral backbone and white haze, we were reminded of Canada in February. Worse, since this is a shallow site, we never got below 20 feet, and because we are good on air, we spent almost two hours being reminded of Canada in February! We investigated the massive white coral "backbone" that runs perpendicular to shore. We've named this huge structure Kaumo'o (Hawaiian for "spine"). 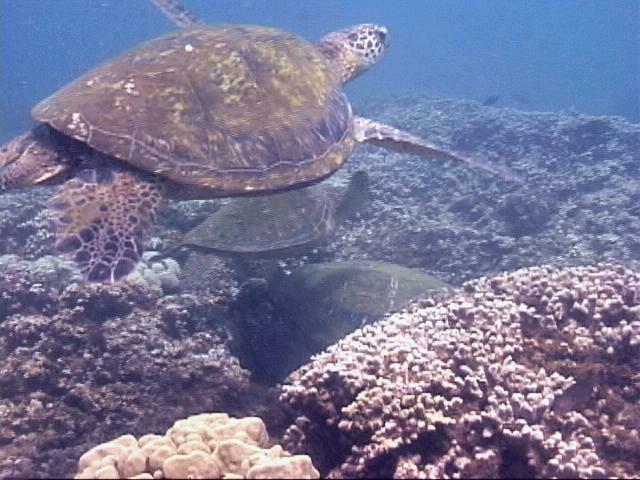 There are many honu at Kuamo'o. At one place, six large turtles rested together, while three or four others soared in the water above them. One by one, they grew nervous at our presence and left. One by one, however, they grew nervous at our presence and left. We know from our own experience in the early 90s that honu need time to acclimate. The problem is we intend on diving only once or twice a week at Kuamo'o. With such limited contact, we have to wonder whether the Kuamo'o Ohana will ever get used to our presence. Still, there's work to do here. We planted the logger. We recorded turtle faces. We're getting some idea of the fibropapilloma rate and severity here. There's value to diving this place. 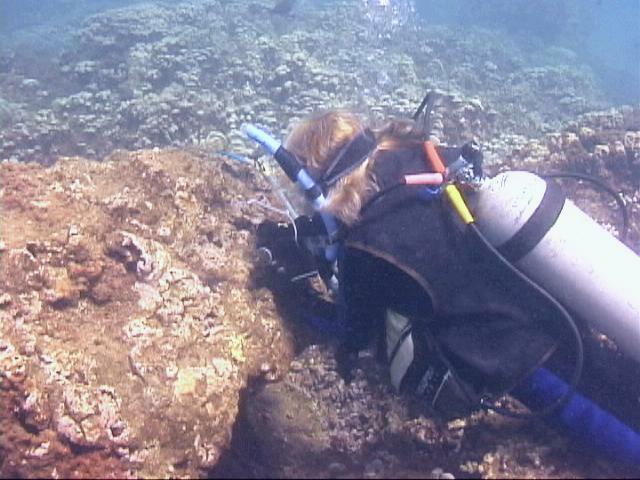 After a morning of hazy water and retreating turtles at Kuamo'o, we decided to return "Home" for our afternoon dive. We were doing our usual tour when we spotted a male in the sand. We concluded from his spanking clean shell that he was probably newly returned from his breeding migration. A bit closer and we recognized him. It was Nui! On this July 31st afternoon we saw him for the first time for Summer 2003. We've known Nui since 1990. The summer must've taken a lot out of him. 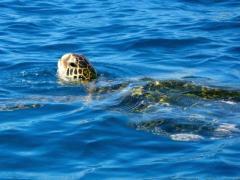 It's clear that he just completed the 500-mile return swim from his breeding grounds at French Frigate Shoals. Nui appeared thin but more than anything, he looked so tired. What with Nui's return, we can now expect to see other males come home. For example, we haven't seen Tamu yet. And the Most Missed is Zeus. Where is Zeus? That's the problem with really getting to know turtles. When they're missing, you worry. When George visited us this week, he came bearing photographs. He was delighted to tell us that Tiamat, a turtle we've known since 1991, is nesting at East Island, French Frigate Shoals for this summer. 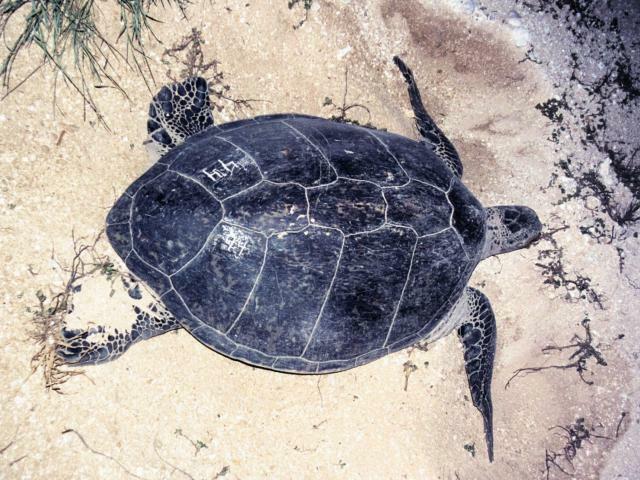 Tiamat, a turtle we've known since 1991, is nesting at East Island. So the good news is we know that "Ti" is laying her eggs like all good honu mothers. With this being August, however, we know that she is probably now swimming home through 500 miles of open ocean. That's a lot of water! We're hopeful that Tiamat will get home in time for us to see her, so that we'll know she made it home safely. 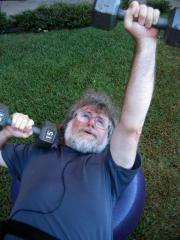 What with other early morning commitments, our exercise regimen suffered badly. We just don't feel right when our routine is interrupted. 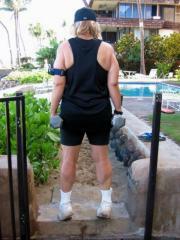 So this week, after kayaking most mornings last week, it was nice to slip back into our regular exercise pattern. Warm up. Two-mile jog. Strength training on alternate days. 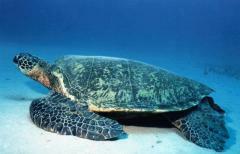 One of our many goals is to dive with these honu for another decade. Ten more years--that's a rather ambitious "brass ring" when we're both already well into our 50s. We need strong arms and shoulders. We need strong arms and shoulders to drag heavy cameras underwater. We need strong legs for obvious reasons. Sea turtles are so long-lived, and with just 16 summers we've merely scratched the surface of the surface in understanding them. The goal is ten more years of diving. That means we have to exercise. Except of course for our Day-Off-Relax-a-Bit Sundays.